Letterman's last show tonight; UBS agrees to $500m fine; Steph Curry's daughter steals the show at post-game press conference; Largest auto recall in US history begins. 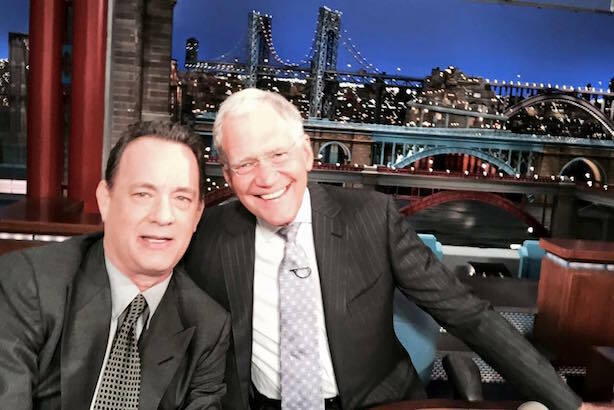 A-Listers David Letterman and Tom Hanks earlier this week. (Image via Facebook). 1. Wednesday night will be the end of a late-night era, as David Letterman signs off as the host of the Late Show on CBS for the last time. He’s fronted more than 6,000 shows over 33 years. The evolving, post-Letterman late-night environment is more social media driven, presenting new challenges for PR pros trying to get clients placed on programs such as the Late Show and its competitors. 2. Domino’s will let consumers order pizza via Twitter starting on Wednesday, making it the first major national restaurant chain to do so. One key ingredient of social media partner CP+B’s strategy for boosting awareness of the feature: emojis. 3. UBS has agreed to hand over $545 million to US authorities after an investigation into its alleged manipulation of currency rates. The fine was lower than expected. Four other multinational banks are expected to plead guilty to criminal charges after a currency-manipulation inquiry, according to Reuters. 4. The two-year-old daughter of NBA MVP Stephen Curry took over the Golden State Warriors star’s post-game press conference on Tuesday night, bringing a new level of cute to sports media events. Curry scored 34 as his team rallied to beat the Houston Rockets in game one of the Western Conference Finals on Tuesday night. 5. Four cancer charities have been accused by the Federal Trade Commission of stealing $187 million in donations from consumers. They are Cancer Fund of America, Cancer Support Services, the Children’s Cancer Fund of America, and the Breast Cancer Society. 6. Takata airbags are at the center of the largest auto recall in US history, but the National Highway Traffic Safety Administration is doing most of the talking on the issue. "We will not stop until every air bag is replaced," said Anthony Foxx, secretary of transportation, on Tuesday. 7. Hillary Clinton took a handful of questions from the media on Tuesday, a rare event in her young campaign. Her message: no one wants the emails from her time as secretary of state released more than she does.